Thailand's military junta chief Prayuth Chan-ocha has declared himself as acting prime minister until someone can be found to serve the post full time. Prayuth, who is also the army chief, will act as acting prime minister for administrative purposes, Bangkok Post on Friday quoted as saying an announcement by the National Peace and Order Maintaining Council set up following Thursday's military coup. The announcement was made late Thursday night. Prayuth Chan-ocha on Thursday declared a coup, saying it was aimed at stopping further loss of life and preventing the conflict in the country from further escalating. 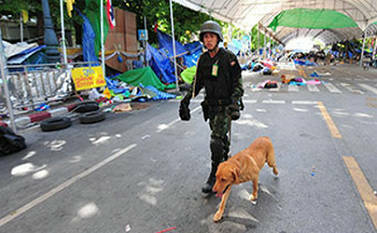 In an address to the nation, he said to restore order in the country, the Thai armed forces needed to seize power. "In order for the country to return to normal quickly, the National Peace and Order Maintaining Council comprised of the army, the Thai armed forces, the Royal Air Force and the police need to seize power as of May 22 at 4.30 p.m."
Prayuth said that the council was formed to seize power and the power seizure was necessary to protect the life of the people. He asked the public to go on their daily lives as usual. He also said the takeover would not affect international relations.